The year was 1999 and The Undertaker was about to marry “The Billionaire Princess” Stephanie McMahon, but “Stone Cold” Steve Austin interfered in the nuptials. Later, Hunter Hearst Helmsley would fake marry Stephanie and proceed to real life marry her and become the second most powerful individual in the now WWE. That isn’t how it HAD to happen though. Imagine a universe where Austin is embroiled in other affairs, so absolutely no one stops the wedding vows of the Dark One, Hell’s Other Favorite Son and the Spoiled Brat of Boobage. Now take a step further and imagine that because of this fake marriage, Mark and Stephanie fall in love and his career runs in slightly different states with different angles and story-lines. It all ends with him at the top hiring people, creating television and making WWE a bigger market than ever as the COO facing a cadre of implants from the UFC with Brock Lesnar only being the start of dangerous men. Before that though in 2011, The Dead Man already in a position of power although not officially used his influence to make sure Wrestlemania would be the of the biggest and bestest WM ever. In the time-line envisioned here many other things have happened, putting various individuals in stories unexpected. In this universe for example in 1995 before UT saw the arrival of long lost brother Kane, a dentist by the name of Issac Yankem, DDS came into the WWF and unleashed hell. So much damage that he never went away, he ended up building his practice, and sticking around, allowing a time rift in which both he AND Kane existed, but that’s another story for another time. Many stories are for another time actually, as between 1999 and 2011 this new WWE went through some of the most amazing events of almost unfathomable unexpectedness but The Undertaker would still achieve his legacy held streak of being undefeated at Wrestlemania. After many years of amazing opponents taken out left and right, who was left? Who could actually challenge The Dead Man? The call went out as they looked for someone with the right enough of chutzpah, grandeur, legendary aspect and a man who Undertaker had never faced before. Once they found their man though, it was kept secretive, as mysteriously dark videos started to debut that seemed to announce the arrival of one man who had walked both the dark side and the side of the angels. A man everyone in the WWF should fear as most of them if not all had never had to deal with his unleashing. A man who was fast as a cat and big as a bull, a man who walked rafters and the underground effortlessly. No one knew for sure why The Stinger was coming, but all hints said he was on his way. Then one cold night in February he made his motives known. He was after one thing and he would do whatever he could do to achieve it. 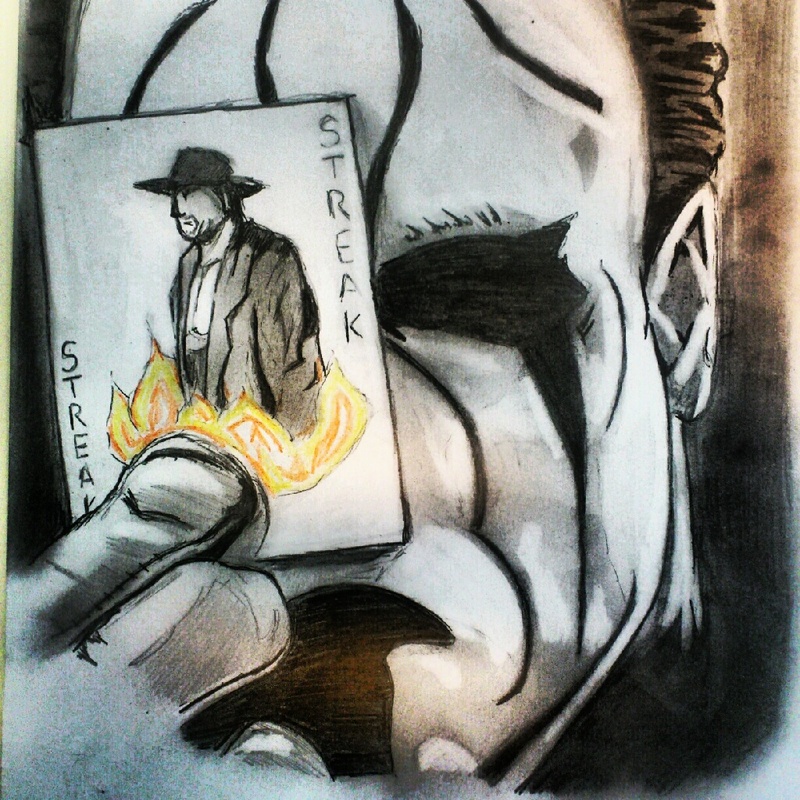 Sting would cement his legacy by ending The Dead Man’s, by hell or high-water, Undertaker would burn and Sting would rise to the pantheon. Undertaker-COO by The Wrestling Cartoonist. Check out more of his awesomeness on Facebook. Sting vs. The Undertaker by Nik Towers. For more Nik check out the Zine, CALLING SPOTS, his art collective Pencil Tree and on Twitter @PencilTree.